3 Bedroom Detached Cottage For Sale in Ventnor for Offers in excess of £550,000. 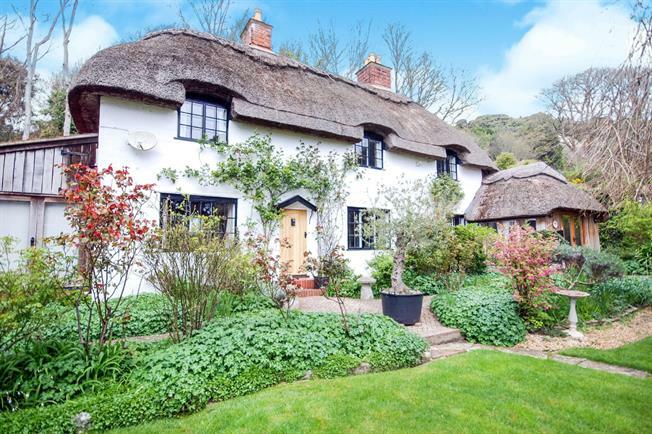 Occupying a large plot and surrounded by beautiful mature gardens is this charming thatched cottage, built in the 1930's and designed by the distinguished architect M.H Bailly Scott. This picturesque cottage offers masses of living space with three double bedrooms upstairs and three reception rooms downstairs whilst keeping many of its original character features such as an Inglenook fireplace, AGA & original wood beams. Outside the mature gardens offer a fantastic space for entertaining or marvelling at the stunning flower beds & mature shrubs. The property benefits from a large garage, car port & off road parking and oozes character & charm as well as offering sea views. To the side of the property is a large double garage with a car port & off road parking for approximately 4 vehicles. The property sits on a large plot surrounded by picturesque gardens, made up of lawned areas, mature shrubs and flower beds. A stunning flagstone path leads you from the front gate, past the weeping ash tree to the front door. To the rear is a terraced garden with a bench, making an ideal place to relax.